U.S. government shut down? Orbital mechanics don't care. NASA's Juno spacecraft swings by Earth today in a maneuver designed to give it the necessary trajectory and velocity to reach Jupiter in 2016. 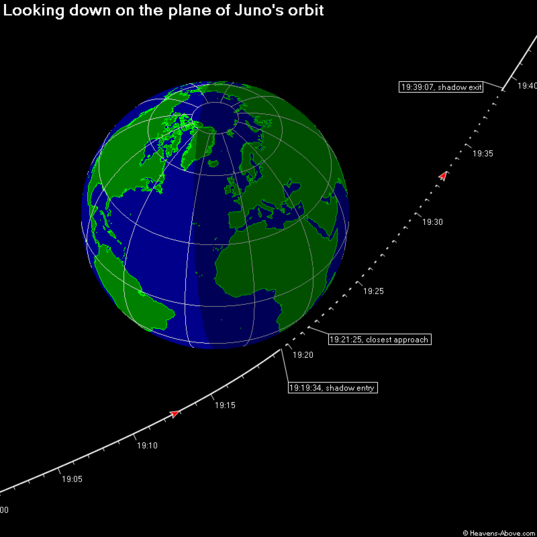 Juno's closest approach will occur at 12:21 pm PDT / 3:21 pm EDT / 19:21 UTC today, passing a mere 347 miles (559 kilometers) from the Earth's surface. Make sure to wave (or even say "Hi" via Ham radio). So will you be able to see it? The website HeavensAbove.com provides some information for you (see the image below) and more detailed ways to look. From the image below, you can see that it will pass very close to South Africa and Southwest Asia, but it won't be visible from the western hemisphere. You can also follow the close approach via simulation in NASA's very cool Eyes on the Solar System program, which is still up and running, despite the shutdown. They've created a special Juno module to help celebrate today's close-encounter. 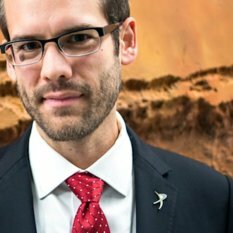 I'd recommend taking some time to explore the spacecraft in this program – you'll find some really interesting information about the exciting science that will happen at Jupiter. Thought it doesn't seem to cover the closest approach, there will be live-feed from a variety of telescopes trying to catch a glimpse of Juno as it barrels away from Earth. Don't forget, the closest approach is 12:21 pm PDT / 19:21 UTC. If nothing else, just pause for a minute and consider that this spacecraft, created and launched by humans two years ago, gets one more brief glimpse of home before pushing on towards Jupiter, never to return. We'll post more updates as they happen today.